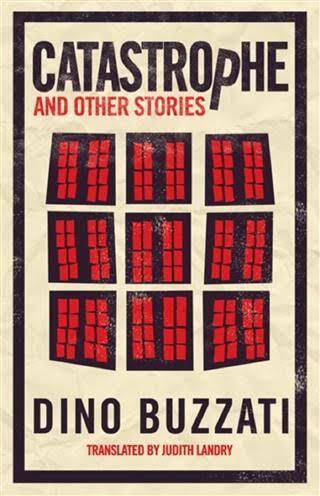 Dino Buzzati is most famous, certainly in the English-speaking world, for his novel The Tartar Steppe. Notable also, though less well-known, is his ‘graphic novel’ (it predates the term), Poem Strip, which he both wrote and drew. Other novels and short stories have been translated but have long been unavailable, so credit is due to Alma Classics for this compilation of existing translations, Catastrophe and Other Stories, originally published in the sixties and seventies, mainly translated by Judith Landry, but with contributions from E. R. Low and Cynthia Jolly. Whether carefully selected or simply typical of Buzzati’s style, most of the stories do, indeed, end in some form of catastrophe. In the opening story, ‘The Collapse of the Baliverna’, the narrator expresses his guilt over the destruction of the building in question, “a huge, grim brick building put up outside the town during the seventeenth century by the monks of San Celso.” It was now “the home of a whole crowd of evacuees, homeless people who had been bombed out, of tramps, deadbeats, even a small group of Gypsies.” (In such documentary detail we see Buzzati the journalist). In attempting to climb the walls, the narrator pulls out a rusty iron spike, which in turn releases another, and then a slab of stone. Within moments the entire building collapses. This brief story might be said to contain a moral lesson, but it largely conveys a feeling; the panic of unintended consequences. When he is asked to move to the sixth floor, not for medical reasons but to accommodate anther patient, he reluctantly agrees – and one can see where the story in inevitably heading. The later stories in the collection (stories are not individually dated so there is not way of knowing if they are, indeed, later stories) are closer to fable, particularly ‘The Egg’ and ‘The Enchanted Coat’, demonstrating Buzzati’s range and skill. This is a wonderful collection, and Buzzati is clearly a writer who deserves exploration beyond a single work. This entry was posted on October 15, 2018 at 7:11 pm and is filed under Dino Buzzati. You can follow any responses to this entry through the RSS 2.0 feed. You can leave a response, or trackback from your own site. Buzzati is a treasure of Italian literature, and I’m happy to see some of his stories back in print in English. There are two slim volumes translated by Laurence Venuti that you can still find second hand and are really working checking out. And yes, I agree fully – clearly a writer who deserves exploration beyond a single work! Somebody ought to write a dissertation on all the Italian literature that takes place in opera houses. Luckily I managed to find a copy of his novel A Love affair at a reasonable price recently so I have that to read next, but I hope more of his work comes back into print. Funnily enough, I was looking at a copy of The Tartar Steppe in the Piccadilly branch of Waterstones earlier this week. (It was on one of their decades tables along with various other books from the 1940s.) Anyway, if I didn’t already have quite so many short story collections in my TBR (something like 12 out of 60 books), then I’d be sorely tempted to give these Catastrophe stories a whirl. They sound really appealing – and very different from much of the fiction I’ve been reading this year. I can definitely see where Seven Floors is heading, but that doesn’t make me any less intrigued to see how the story gets there! I don’t tend to read so many short stories so this was a treat. Hopefully you’ll not be able to resist The Tartar Steppe the next time!